Elementary particle physics is a specialized field filled with strange jargon and seemingly incomprehensible mathematics. Its caretakers are a group of mostly low-key academics save for a handful, such as Richard Feynman and Steven Hawking, who have somewhat become cult figures. One of those low-key academics who is relatively unknown outside the realm of theoretical physics is Dr. Peter Higgs, an English theoretical physicist who, just a little over forty years ago, published a theory that helped physicists to better understand the fundamental interactions of subatomic particles. This year, with the start-up of the gigantic Large Hadron Collider at the Cern Laboratory, Dr. Higgs hopes to finally see the heart of his theory observed in nature. The world of the atom is very strange and very different from the world in which we live. For over a century, physicists have been trying to understand how it works, and they have come up with some comprehensive theories that are complicated, but surprisingly accurate. According to the Standard Model, the fundamental laws that govern natural phenomena (light, sound, gravity, heat, electricty, chemical reactions, etc.) can be derived from four fundamental interactions that take place at the sub-atomic level. These interactions are: 1) electromagnetic interactions (familiar to us as electricity and magnetic fields), 2) strong interactions (which hold protons and neutrons together within the nucleus of the atom), 3) weak interactions (familiar to us as radioactivity), and 4) gravitational interactions. Theoretical physicists have worked for decades to develop a comprehensive understanding of how these interactions work, and how they are related one to another. Their ultimate goal is to develop a single "Grand Unified Theory" that can be used to eloquently explain each of the four fundamental interactions. The first successful elementary particle theory was quantum electrodynamics, which explained electricity and magnetism at the subatomic level. Then, physicists took the first step toward the GUT by creating a theory that unified the electromagnetic and weak interactions into one "electroweak" interaction. Further refinement led to the development of the Standard Model, which unified the electroweak interaction with the strong interaction. The only fundamental interaction that is not well understood is gravitation, but theoretical physicists have been working on a theory of quantum gravitation for some time now. The Standard Model explains electroweak and strong interactions in terms of particles. These particles are not like hard grains of sand or poppy seeds; rather, they are fields of energy condensed around a point in space. These fundamental particles fall into two classes: bosons (named after Satyendra Nath Bose) and fermions (named after Enrico Fermi). The classifications of fermions is complicated -- there are 12 varieties of fermions in the quark family (including particles and antiparticles) and 12 varieties of fermions in the lepton family (including particles and antiparticles). Despite the confusing array of particles developed by the Standard Model, the basic explanation of natural phenomena derived from the SM is quite simple. According to the SM, all matter is made up of atoms, and all atoms are made up of protons, neutrons, and electrons. Protons, neutrons, and electrons are themselves made up of fermions -- protons and neutrons are made up of quarks, while the electron is the most stable member of the lepton family. Wikipedia notes, "The exchange of bosons always carries energy and momentum between the fermions, thereby changing their directions of flight and their respective speed. It may transport a charge between the fermions, changing the charges of the fermions in the process (e.g. turn them from one type of fermion to another type of fermion)." The bosons include the W and Z bosons of the weak force, the gluons of the strong force, the photons of the electromagnetic force, and the yet to be verified graviton of the gravitational force. As an example, here is how the Standard Model explains the force created by a magnetic field. According to the SM, magnetic fields are the result of interactions between electrons -- remember, electricity and magnetism are two manifestations of the same fundamental interaction; you can make a magnet using an electric current (an electromagnet), likewise you can generate electricity by moving a magnet through a coil of wire. The SM states that as one electron (a fermion) interacts with another electron, it emits a virtual photon (a boson) which is absorbed by another electron. As the first electron emits the photon, it recoils backwards, while the second electron is propelled forward as it absorbs the photon. Thus, a force is created between the electrons. On a macro scale, as countless billions upon billions of electrons repel one another, this force is observed as a magnetic field. So far so good. But when the SM is applied to more complex phenomena, the calculations become very difficult. This enormous mathematical complexity stems from the rigid requirements placed on the theory; namely that it must obey the laws of quantum mechanics and special and general relativity, and that it must obey the well-known principles of energy conservation, invariance, and symmetry (with only a handful of specific exceptions). This is just a fancy way of saying that the theory must be valid for every variation of time, space, and energy that is known to have existed in the universe. Once you account for all of those things, you have one heck of a mess. But because the SM works, physicists and cosmologists have been able to input the theoretical conditions that existed in the very early universe, just milliseconds after the Big Bang (when the entire mass of the universe was rapidly expanding outward from a single point of origin containing an incredible amount of energy) and subsequently predict the types of elementary particles that should have existed during the first three minutes of the life of our universe. But how can we verify these predictions? This is where the job of the experimental physicist becomes very tricky. While the structures made of fermions (protons, neutrons, electrons, and so on) are stable enough to form physical matter, observing the actual quarks and leptons (other than the electron) is difficult, because it takes enormous amounts of energy in order to break down the subatomic particles held together by strong interactions. And observing the bosons (other than the photon, which we perceive as light) is even harder, because these virtual particles exist only during fermion interactions, and their lifespan is on the order of 3x10-27 seconds, or 0.000000000000000000000000003 seconds. In order to observe these elementary particles, physicists have built enormous machines called particle colliders. These machines accelerate atoms to nearly the speed of light, and then collide them. Scientists then observe the particles that briefly appear during the interactions of the atoms as they collide. So far, experimental physicists have found a considerable number of the unusual sub-atomic particles predicted by the Standard Model, so confidence in the Standard Model (even though it does not account for gravitation) is very high. Which brings us back to Peter Higgs. In 1964, Dr. Higgs published groundbreaking theoretical work on the weak interaction. The so called "Higgs mechanism" is crucial to the electroweak theory. It postulates a hypothetical "Higgs field" that permeates all of space, and uses a hypothetical "Higgs boson" as the carrier of the field, which in turn gives mass to the W and Z bosons. Wikipedia notes, "The Higgs mechanism is the only way an elementary vector particle, like the W or the Z can have a mass. Interactions with the associated Higgs boson gives mass to the quarks and leptons in the standard model." And because quarks and leptons (and, consequently, protons and neutrons and atoms) have mass, they form the basic building blocks of matter. Thus, if the electroweak theory of the Standard Model is correct (and physicists are very confident that it is), then the Higgs boson must exist. Yet the mass of the Higgs boson cannot be derived from the Standard Model. Experimental physicists have attempted to calculate a lower limit for the Higgs boson mass based on the observed mass of other subatomic particles, but so far nothing resembling a Higgs boson has been observed. Dr. Higgs is now 78 years old, and he hopes that the Large Hadron Collider, which can theoretically produce energy levels within the range of the predicted lower limit for the Higgs boson's mass, will finally show the world an elusive Higgs boson, a particle that exists at extreme energy levels that occurred in nature only during the moments immediately following the Big Bang. The Higgs boson has been given the colloquial moniker "The God Particle," so called because of the God-like omnipresence of the theoretical Higgs field, and its fundamental necessity to the existence of atoms, and therefore to the existence of nature itself. Discovering (or failing to discover) the Higgs boson will certainly increase our meager knowledge of how the universe works. "I will certainly open a bottle of something," said Dr. Higgs, in the event that his namesake particle is discovered. But if its discovery eludes scientists, Dr. Higgs will be "very, very puzzled. If it’s not there, I no longer understand what I think I understand." What a curious way to spend one's final years. I'm a little late getting to this, but astronaut Wally Schirra passed away last week at the age of 84. 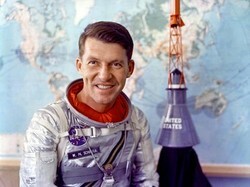 I remember Wally Schirra as Walter Cronkite's right-hand man during the Apollo space flight broadcasts, patiently explaining the details of the mission to CBS News audiences, wiping the tears from his eyes whenever Apollo 11 marked the beginning of an era with its simple message: "Houston, the Eagle has landed." In later years Schirra appeared on TV commercials and is probably most remembered for hawking the nasal decongestant Actifed. Schirra was the only astronaut to fly the Mercury, Gemini, and Apollo spacecraft. And the reason he became Walter Cronkite's right-hand man is that he repeatedly refused to obey orders while mission commander of Apollo 7. Schirra and his crew decided to forgo the written flight plan and concentrate on activities that they felt were better suited to testing the design of the spacecraft and the endurance of its crew. All three crewmembers suffered from headcolds while in space, and Schirra and his crew disobeyed a direct order from the NASA flight surgeon to wear their helmets during re-entry, fearing that the excess pressure in their pressurized suits might cause their eardrums to rupture. For this insubordination, Schirra was deemed unfit to fly in space again. My wife discovered these guys devouring the asclepias that she planted in our front flower beds. She didn't know that asclepias is actually the family of the milkweed plant. 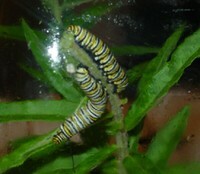 I immediately identifed the little critters as monarch butterfly caterpillars. We decided to pluck them from the plant and place them along with several milkweed stalks in an old glass terrarium, in order to spare them from Mom's terrible bug spray wrath. 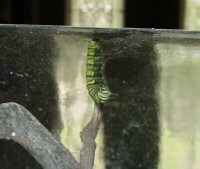 We found 5 caterpillars, three large and two about 1/2 inch long. My six year old has already named the three largest - Charlie, Hungry, and Crawls. She also informed us matter-of-factly that it is a sin to kill God's creatures. According to monarchwatch.org, these large caterpillars are almost ready to molt for the last time and transform into pupae. 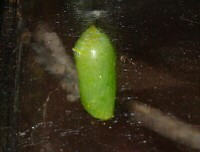 We'll set up the terrarium with branches for the pupae and I'll keep the blog updated with their progress. Q: What's the difference between a physicist and an engineer? A £2 billion project to answer some of the biggest mysteries of the universe has been delayed by months after scientists building it made basic errors in their mathematical calculations. It means that 24 magnets located all around the 17-mile circular accelerator must now be stripped down and repaired or upgraded. The failure is a huge embarrassment for Fermilab, the American national physics laboratory that built the magnets and the anchor system that secured them to the machine. It appears Fermilab made elementary mistakes in the design of the magnets and their anchors that made them insecure once the system was operational. Well, at least those poor Falungong practitioners aren't locked up at Gitmo, where they would experience the truly savage inhumane treatment meted out by BusHitler's secret CIA torture squads. UNITED NATIONS (Reuters) - Some 2.6 billion people in the world, mainly in Africa and Asia, lack access to basic sanitation, increasing the risk of diarrhea and other diseases fatal to children, said a U.N. report released on Thursday. UNICEF, the U.N. children's fund, in a study on water and sanitation in developing nations, concluded that U.N. goals could be met on clean water, especially in urban areas, but the same was not true for access to the crudest of toilets. The report, Progress for Children, surveyed available clean water and sanitation facilities from 1990 to 2004 and calculated which countries could meet goals set at a U.N. Millennium summit in 2000. These include cutting in half by 2015 the proportion of people without safe drinking water and basic sanitation. "Despite commendable progress, an estimated 425 million children under the age of 18 still do not have access to an improved water supply and over 980 million do not have access to adequate sanitation, said Anne Veneman, UNICEF's executive director and a former U.S. secretary of agriculture. Overall, about 1.2 billion people, or an increase from 78 percent in 1990 to 83 percent in 2004, had access to drinking water, a figure that would meet the Millennium goals. Still, more than 1 billion people were without clean water in 2004 from sources such as wells or springs, a number which may increase as the population grows, the report said. Although I believe that free enterprise capitalism allows us to generate ever-increasing amounts of wealth -- which can then be used to combat problems like these -- the truth is that at any given point in time there is only a finite amount of wealth and time that can be distributed among the various efforts undertaken to improve people's lives. It seems to me that we should make sanitation -- a problem we already understand very well -- a top priority. Then we can worry about the other things. The FDA has eased its limits on Plan B, the so-called "morning after pill." Women 18 or older can now buy the pill without a prescription, although the pill will be kept behind the counter at pharmacies. Plan B is not RU486, the so-called "abortion pill." RU486 terminates an existing pregnancy and has been linked to increased risk for breast and uterine cancer. Feminists enthusiastically supported this decision, but given the current "fertility gap" between liberals and conservatives, they are the ones who should have been the most concerned. The Times Online is reporting that there is now a new harvesting technique for embryonic stem cells that does not involve the destruction of a living embryo. However, it is unlikely that this development will affect the thriving gray market in Europe and South America for "beauty treatments" based on the injection of stem cells harvested from aborted fetuses. The moral slope of this issue is already precariously slippery.